Just a quick hello to say hey, I’m still alive – even though I haven’t been posting! What I have been working on is a new pattern collection (inspired by Kyoto in spring – so pretty!) and setting up a new online shop! I’ve heard really great things about Society6 from other artistic friends and I’ve decided to give it a go myself – please check it out! And below, my first pattern from my new collection – Cherry Blossoms (Aqua). Spring is coming, I can feel it!! Finally my gruelling contract has ended and I can actually focus on putting a portfolio together. Throughout the last few months I’ve spent my spare hours collecting old doodles and photographs of flowers (of which I have MANY) and using them as inspiration for my own range of pattern designs. I’m still finding my feet in this field so I’m not sure how perfect they are yet, but when I discovered surface pattern design it was what I could only describe as a lightbulb moment. I’d always loved patterns: I’d always been drawn to them and I liked copying them when I was younger, eventually making my own pieces on Illustrator. Yet it never actually dawned upon me there were people out there who made patterns for a living. 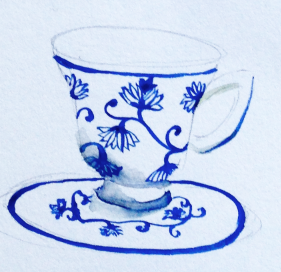 Anyway, rather than embarking on any giant new projects, I’ve kept myself going with teacups. It started out as a watercolour exercise – a way to practice with colours and brushstrokes whilst seeing how many designs I could imagine. 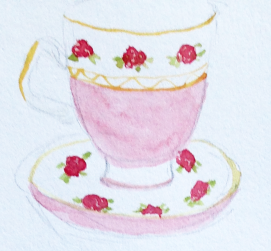 I think I must be quite a satisfying British friend by fulfilling an awful lot of clichés: apart from being very pale and very polite, I absolutely love tea and everything to do with tea. 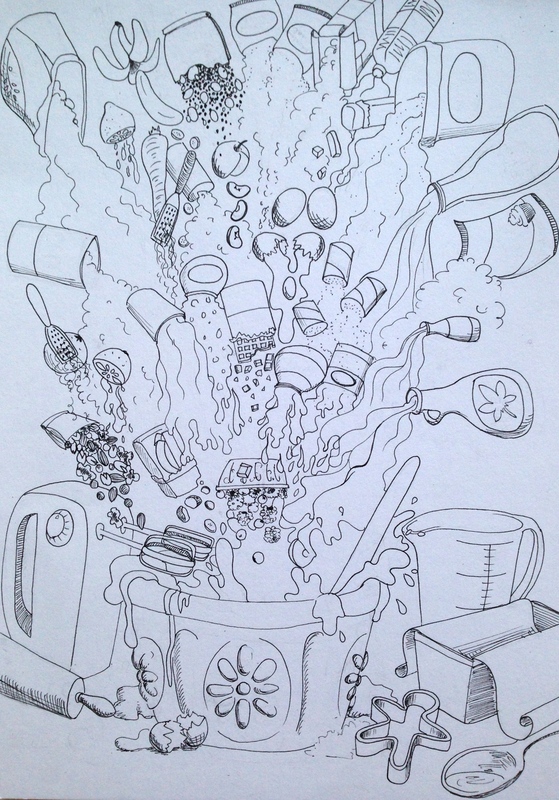 I love the ceremony of making tea, the boiling of the kettle and collecting all the cups and teabags and pots. I like drinking tea with people: there’s nothing better than catching up with friends over a hot cuppa. Tea is hospitality. I grew up in a large extended family which whenever you entered anyone’s house, tea is always offered, so every visit is always preceded by the ceremony of tea-making. Even better, tea and company is an excuse to get out the teapot and pretty cups, which somehow makes tea taste even better! I wish I had more of these in my cupboard! This is an initial sketch – I’ve been playing around with the idea of illustrated lists – if your baking is not messy then you’re not having enough fun! !